Instant Pot Clam Chowder provides all of the flavors of classic Clam Chowder. But makes it in the fraction of the time when compared to traditional cooking methods. 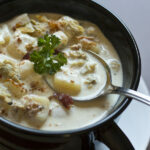 The thick chowder is filled with a ton of flavor and is perfect to eat any day of the week. A bowl of Instant Pot Clam Chowder. But it is especially popular in Winter and early Spring. Not only does clam chowder make for a great and warming comfort meal, but clams are also in season during these months in many states. In fact, fork lore states that shellfish should be eaten in any month that includes the letter ‘r’. Based on this theory, you should enjoy clam chowder from September – April. So not only is it the perfect meal during the cold months, it is a great meal to serve during Lent, minus the bacon of course. What is Authentic Clam Chowder? 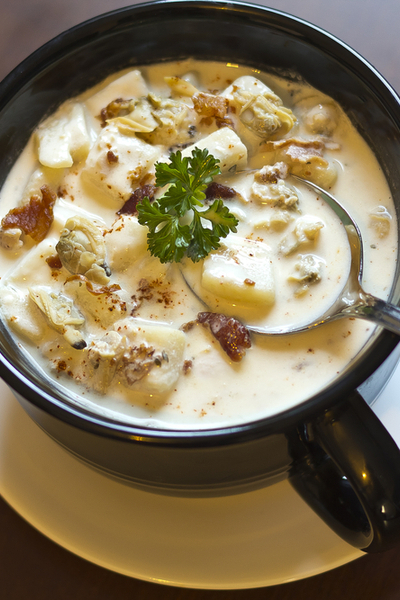 If you order a bowl of clam chowder, it will look and taste different depending on your geographical location. A bowl of Manhattan Clam Chowder. In the most basic definition, clam chowder is the combination of clams and broth. It often includes other ingredients and they vary depending on your location. This Instant Pot Clam Chowder recipe has a thick and creamy base. This is considered classic clam chowder found in New England/Boston. However, if you order clam chowder in Rhode Island, you will likely find a more clear and thinner broth based chowder. 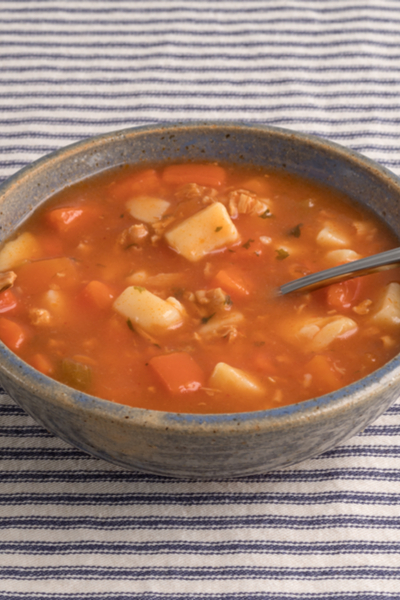 And just a couple of states away, the popular Manhattan Clam Chowder includes tomatoes and has a red broth base. When I decided that I wanted to make a pot of clam chowder, I immediately turned to my Instant Pot 6 quart Duo. Drain the canned clams over a bowl to reserve the clam juice. I absolutely love to make soups in my pressure cooker. It takes just a fraction of the time as it does on the stove or in the slow cooker. And the flavors are so much better when cooked under pressure. Some of our favorite Instant Pot Soups are Loaded Baked Potato Soup and Chicken Tortilla Soup. 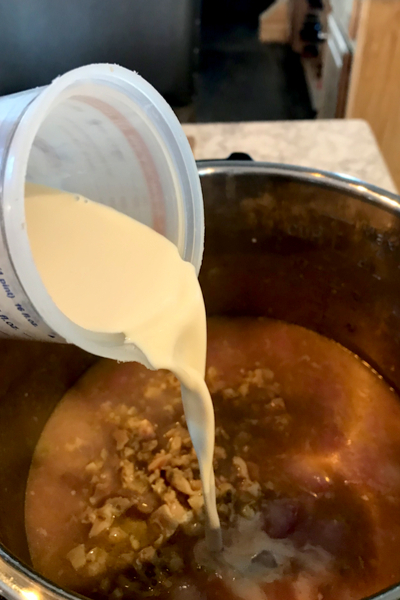 But Clam Chowder is especially easy to make in the Instant Pot because this recipe uses canned clams which are already cooked. So the only thing that you are truly cooking is the broth and vegetables. 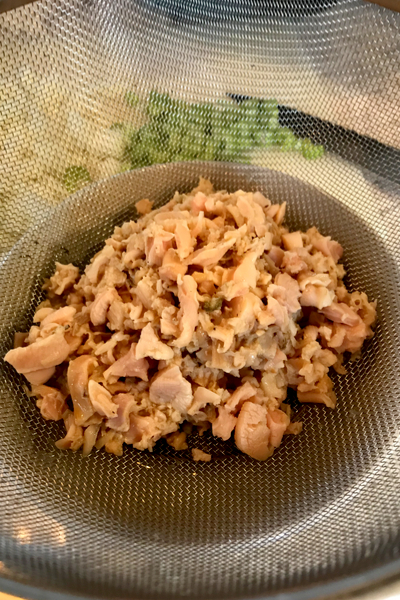 The broth is the combination of the clam juice from the canned clams combined with a little bit of water or fish stock. Clam juice and water/fish stock to make a total of 2 cups of liquid. After opening the canned clams, drain the juice into a bowl. Pour the juice in a 2 cup measuring cup. Most likely you will have about 1 3/4 cup of clam juice. Add enough water or fish stock to make a total of 2 cups of liquid. After you saute the bacon, onions, celery and garlic, add the stock mixture to deglaze the bottom of the pot. Add your red potatoes and pressure cook for 4 minutes. Yes, only 4 minutes! 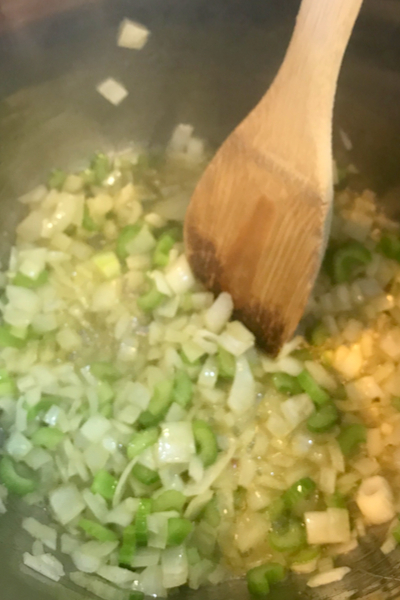 Saute onions and celery directly in the Instant Pot. However, don’t forget the time that it takes the pot to come to pressure. Although every Instant Pot is different, it took 8 minutes for my 6 quart Duo to come to pressure. After the cooking time expires, allow the pot to naturally release pressure for 4 minutes before manually releasing any remaining pressure. All that is left to do is to add the clams and half and half and let it thicken. Because the Instant Pot Clam Chowder needs to thicken after you add the clams and half and half, you must heat the mixture on Saute mode. Add the clams and the half and half after the pressure cooking process has been completed. However this needs to be done carefully in order to prevent scorching the bottom of the pot. For those that are new to Instant Pot Cooking, be sure to get yourself familiar with these Instant Pot Beginner Tips. In order to thicken the chowder successfully, the saute mode needs to be adjusted to the LESS setting. Do this by pushing the SAUTE button and immediately push ADJUST until the setting has been changed to LESS. Change the saute mode to the Less setting by pushing the ADJUST button. This will allow the pot to saute on a lower heat to allow for proper thickening without burning the bottom of the chowder. A delicious, traditional, cream based chowder filled with clams, onions, celery and potatoes and made in a fraction of the time in the Instant Pot pressure cooker. Drain the the clams over a small bowl, saving the juice. 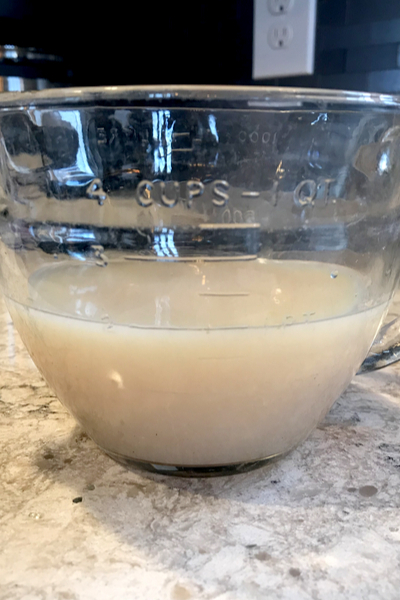 Pour clam juice into a 2 cup measuring cup and add water/fish stock to the clam juice to make a total of 2 cups of liquid. Set aside. Press Sauté on the Instant Pot and add the chopped bacon. Cook, stirring occasionally, until fat has rendered out of it, but not yet crispy. Add the butter, onion, celery, and thyme. Cook until the onions begin to turn translucent. During the cooking process scrape the bottom of the pot to deglaze and loosen any brown bits. Add the garlic, salt, and pepper. Cook for 1 minute, stirring frequently. Add the potatoes and clam juice mixture and stir. Push Cancel. Lock the lid and place valve to the sealing position. Pressure Cook/Manual on HIGH pressure for 4 minutes. When cook time has ended, allow for 4 minutes Natural Pressure Release, then do a controlled Quick Release by slowly releasing the valve to the venting position. Carefully open the pot and stir. Use a potato masher to carefully mash a few of the potatoes to thicken the liquid. Turn the Sauté function on LESS and add the clams and half and half. If desired thicken by removing ½ cup of the hot liquid and whisking in the corn starch or arrowroot powder. Whisk well and stir the mixture back into pot until desired consistency is achieved. Serve warm and garnish with chopped green onions. *For a meatless version, leave out the bacon.